Cold weathers are not to be taken lightly. This 2017/2018 winter showed itself that it does not play games, as there have been many harsh temperature changes throughout the world. Preparation and warnings are to be taken very seriously into account, and most importantly, proper clothing is required. This is where the Ezycaps Polar Fleece Beanie comes in. It is a trademark beanie with a cozy-soft material. It is a napped insulating fabric made from polyester which will keep your head warm and tops it off with a modern look. Today, the modern headwear is nothing without the addition of the almighty beanie. Millenials are the ones who are generally characterized by the beanie. It is a staple in some subcultures such as the hipsters’ subculture, which can be usually seen hanging around coffee shops. Amusingly enough, they rock their beanies in the summer. Throughout the ages, the sheer coziness the almighty beanie provides is just enough to keep it popularized for all generations, while the stylish look never fails to grab attention and effortlessly stand out from the crowd. The Ezycaps Polar Fleece Beanie is a one size fits most cap, which is specially designed for cold winters. The high-quality material makes sure there are no rips and tears, and above all, Ezycaps offers free embroidery on the space of the beanie for any of your promotional needs. You can stitch any logo, message, or picture you like on the beanie and we guarantee flawless delivery. It is a perfect promotional headwear item which is characterized by sheer style and a modern 2010s look, guaranteed to attract attention. It can also be used as the perfect gifting item, but the best choice for it is to use it as a marketing and promotional item for your business needs. Generally speaking, polar fleece is used in many types of clothes such as sweaters, sweatpants, jackets, blankets, hoodies, and many other outdoor clothing types which require a sturdy material for the harsh weather. Easy to wash, it is soft and very light, and the best quality of all is that it keeps you warm just as much as wool materials’ ability to keep a warm body temperature. Outdoor workers such as ice fishermen will wholeheartedly appreciate the cozy warmth and comfort of our Polar Fleece Beanie. Another characteristic of the beanie is that it’s hydrophobic, meaning – it holds less water than 1% of its weight, and it dries quickly. It is the perfect alternative for wool. So if you are allergic to wool, this beanie is perfect for you! A fact well-worthy for mentioning; it should be noted that regular polar fleece is not windproof. That means that it does not absorb moisture, can generate static electricity, and you should take great care not to put the fabric close to high temperatures. 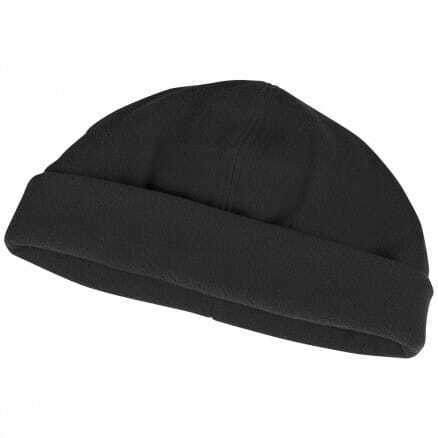 The Ezycaps Polar Fleece Beanie is not recommended for high temperature washing and ironing. So, if you are in a dire need of a proper headwear for the winter chill, and at the same time, you would like to stitch a logo for promotional or personal needs, the Ezycaps Polar Fleece Beanie is a perfect choice for headwear. We guarantee high-quality, comfort, and durability. The Ezycaps Polar Fleece Beanie is available in colours: Navy, Bottle, and Black.